Today I almost cried as I read a book aloud to my kids. The scene wasn’t poignant. No one lay dying nor was anyone confessing unrequited love. Still the darkness pressed in around my heart. The heaviness of life, friends fighting cancer, the ton of feathers falling on my shoulders, and my ongoing battle to get my foot healthy again. They are acts of defiance. 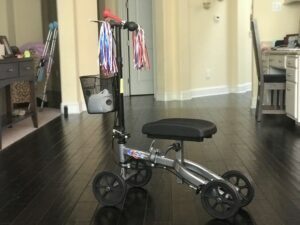 The thought came to me as I looked at the horn, streamers, and stickers on my knee scooter. 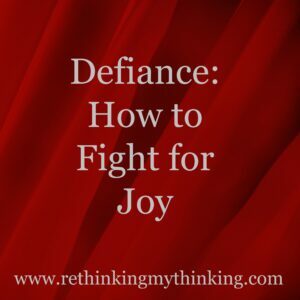 Defiance against the blues – against the sadness that makes getting out of bed harder than it should be. They are weapons in the war for joy. The battle that rages each waking moment. It is a war I cannot afford to lose because my kids need to know how to fight it. How can they know unless I teach them? “You have such a good attitude about your injury.” I’ve heard the words and every time they feel like lies. And though my words ring with truth some days they feel hollow. My good attitude isn’t something I was born with or lucky to have. It is something I fight for. It is my battle cry to keep from falling into the dark deep abyss of self-pity and sadness. It is my cry against injustice and evil in this world. These crazy reminders are not bold declarations of strength. No, they are reminders that in so many ways I am weak, but God is strong. They remind me to put my hope and trust in God alone – for He will fight for me. Are you fighting for joy? You are not alone. Let’s battle together. How are you fighting for joy today?